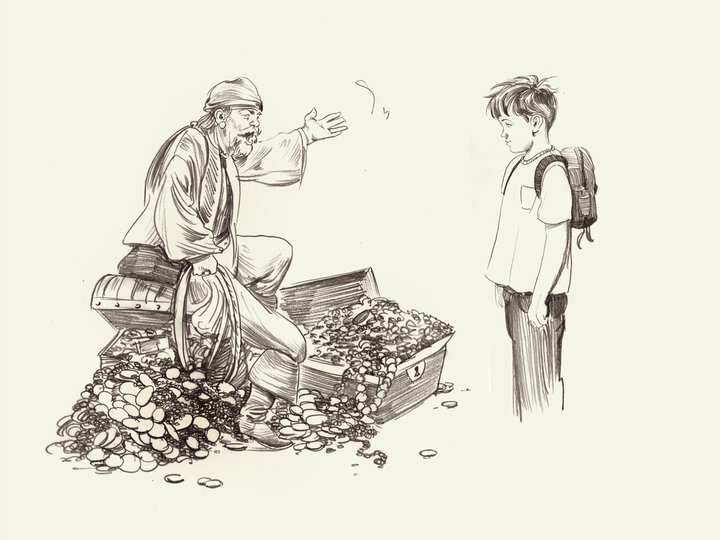 Greg Ruth, illustrator of A Pirate’s Guide to First Grade, recently shared a piece of art that never made it into the book. Don’t you love it? The thick brushstroke of blue, the off-kilter headlong forward whoosh of the whole thing. How can something that great not make it into a book? What else is in Greg’s garbage pail? Can you imagine having that much talent? I should note that to their great credit, the folks at Feiwel & Friends expanded the book beyond the industry standard of 32 pages, going to the expense of a full 48 pages. Very rare, these days. I believe they reached this decision when Greg’s artwork came in, and sometime after they picked themselves up from the floor. When you look at Greg’s illustrations — his first true picture book for children — you can understand why they felt compelled to give him the scope and space his work deserved. Something special was happening.